What Is a Virtual Mailroom, And Should Your Business Use One? home / STARTicles / What Is a Virtual Mailroom, And Should Your Business Use One? A virtual mailroom is a service that combines physical, paper mail with the convenience of the Internet; for a monthly fee, your mail will go to a business mailing address where it is then received and an image of each envelope is scanned. By accessing a secure website, you can upload the images and then choose the next step – shredding or recycling, opening the letter and scanning the contents, forwarding the mail to you, and even depositing checks or paying bills. Is it worth the time and cost to go through the extra steps of having someone else scan and open your mail? That depends on your business’s needs. If you value a paperless office, this is a great solution. The virtual mailroom service handles the shredding and scanning for you as mail arrives, which makes for an organized and streamlined mail process. A virtual mailroom can also offer continuity for businesses that change addresses for any number of reasons, including mergers or downsizing. One service offers a choice of “prestigious” addresses like Park Avenue in New York or Market Street in San Francisco, which can give a small company the illusion of a much bigger presence. Security is another consideration. You are contracting with a third party to open your mail, and in some cases, deposit checks or handle sensitive documents. 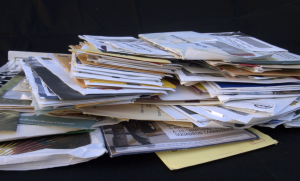 On one hand, the shredding a virtual mailroom does for you, if you request it, can help protect your security. On the other hand, sending scanned images over the Internet inevitably opens the door to other security threats. Here’s what you get with two of the most popular plans, Traveling Mailbox and Earth Class Mail. Both offer multiple tiers of service, depending on the volume of mail you would want scanned and the number of recipients (business names or employee names that the mail would be addressed to); we’ve highlighted the basic plans each company offers here. Traveling Mailbox offers a very reasonably priced virtual mailroom with addresses in twelve U.S. cities across eleven states.